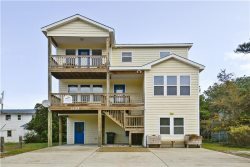 With the Cape Hatteras National Park preserve and sound to your South, the ocean to your East, and convenient access to area shopping restaurants and attractions, A Bit of Heaven is the perfect spot for your next Outer Banks vacation. This lovely, newly renovated home combines the taste and beauty of the old with the modern of the new. A Bit of Heaven offers approximately 2300’ sq. ft. of heated living area, which allows for both privacy and family time together. The stainless steel appliances, new furniture, hardwood floors, plantation blinds and beautiful landscaping are just a few of the great additions that make this home special. Spend time lounging by the private swimming pool, playing in the surf on the sandy beaches or relaxing in the hot tub. Later on, you can challenge the group to a game of pool in the downstairs recreation room or cozy up for a movie and popcorn in front of the flat screen TV. No matter what your interests, there is plenty to enjoy at this fantastic Nags Head retreat. Top-Level: King master bedroom with garden tub in bath, living room, dining area, kitchen, Powder room, sun decks with views and screened porch. Mid-Level: King master bedroom, Queen bedroom, bedroom with Pyramid Bunk and full shared bath. Ground-Level: Covered parking, pool entrance, hot tub recreation room with pool table, TV, wet bar and Sleeper Sofa, laundry room and half bath. Bedding: 2 King, Queen, Pyramid Bunk and Sleeper Sofa.